Both sides of Avery Hill Road, 0.75 miles north of Route 214. Parking lot on East tract. Approximately 1 mile of hiking trails. West Tract, 76.59 acres (1970). Open upland woods, Billings-Avery Brook and glacial boulder deposits. East Tract, 22.48 acres (1977). Maple swamp and upland woodlands, giant rhododendron, atlantic white cedar, orchid species. Sheep Wash Tract, 0.49 acres (1995). Historic dry-wall sheep wash, south of Billings-Avery Brook. 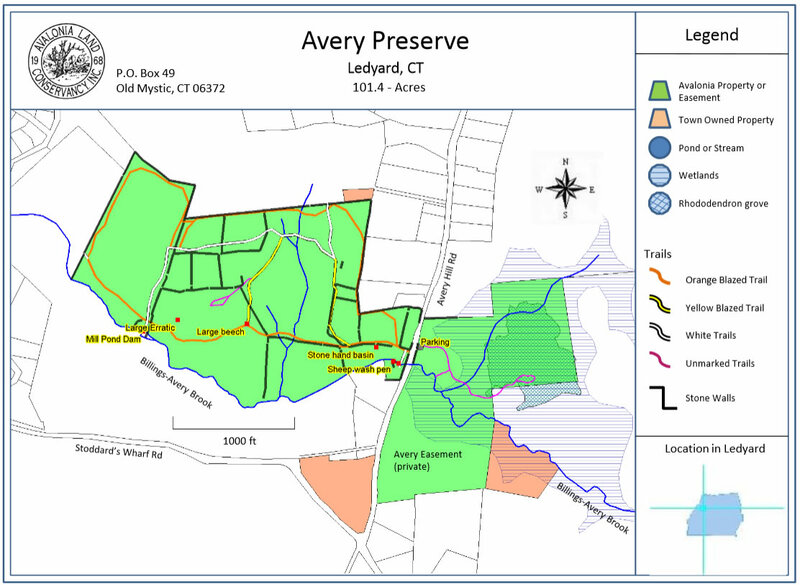 Town of Ledyard Transfer, 0.53 acres (2014). Addition to the west tract.